How your home looks from the outside reflects your pride of ownership and is the first thing you, your guests and your neighbors see. For landlords and home-sellers, curb appeal is one of the most important factors in attracting new tenants and buyers. One of the best ways to improve the appearance of your house’s exterior is a fresh coat of paint. Whether you’re painting just the trim on your home, or doing a complete repainting, a high-quality paint job done by professionals is a fast, affordable way to give your home a brand-new look that makes it stand out from all the rest. Type of Surface – Almost every surface material on the exterior of your home can be painted, using today’s advanced paints and application methods. Many homeowners are surprised to learn that even faded vinyl siding can be painted to transform the home without the high cost of replacing siding. Our experienced painters can paint your home, regardless of exterior materials. Preparation is Key – Exterior painting success depends on thorough preparation of existing surfaces. Too many homeowners have discovered that painting without proper preparation soon leads to cracking, peeling, and deterioration. Cleaning, scraping, sanding, masking, and many other operations go into proper preparation before painting your home’s exterior. The painters from our full-service handyman company never miss a step in preparation. Paint Selection – For many homeowners, color is the main consideration, but experienced painters, like those at HandyQuick, know that any paint can be mixed to any color. It is the paint itself that matters. Each type of exterior surface or previous finish requires a specific type of paint. High-quality paint costs a little more, but will look good far longer than cheap paint. You pick the color you want, but rely on our painting experts to help you choose the type of paint to use. Details Matter – From meticulous masking to proper application of paint, using appropriate painting tools, every detail of your exterior painting job affects both the appearance of the finish and the durability of your exterior paint. Unlike some painters, our painting experts never miss a step or assume you won’t notice flaws in your exterior paint. They use the proper tools and techniques to give you a flawless end result. A Touch-Up May Be All You Need – For many homes, a complete exterior repainting may not even be necessary. If the finish on your exterior walls is sound and intact, but the paint on woodwork, eaves, soffits, window frames and other parts of your home’s exterior is looking sad, your painters from HandyQuick may recommend a thorough cleaning of your home’s exterior to remove dirt and grime, followed by careful repainting of only those trim details. You can even transform your home’s appearance with a dramatic color change, and you’ll save money by painting just what needs to be painted. 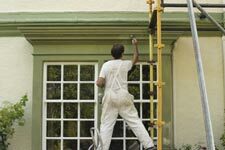 Exterior painting is just one of the many services our Twin Cities handyman company offers for your home. In fact, we’re your one-stop source for just about everything your home needs. We’re much more than just a simple handyman service company. Our extensive network of home repair and maintenance professionals includes seasoned professional experts in every building trade. Whatever your home needs, one call to our home repair and maintenance company brings the expert service providers you need to your home. Our prices are always highly competitive, and our quality of service is always superior.